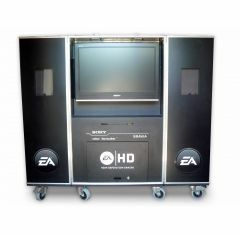 At Absolute Casing, we have designed and manufactured a fantastic and varied selection of entertainment flight cases. 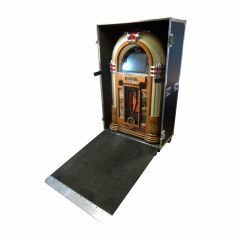 Flight cases for the entertainment industry come in a number of styles and sizes and can be used to house and protect items such as arcade games and juke boxes. Our collection is perfect for the safe transportation of your entertainment items. No matter what equipment you need protecting, we can design and create the perfect bespoke entertainment flight case for you. 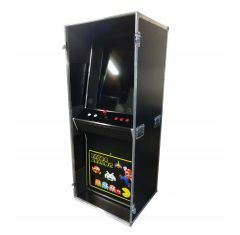 We are specialists when it comes to arcade flight case and juke box flight case solutions. 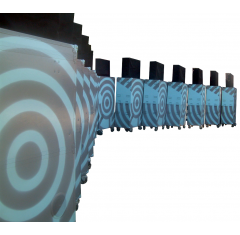 To further add to the bespoke nature and personalisation of your entertainment flight cases we can provide a number of external aesthetic features. Screen-printed logos, coloured materials, total vinyl wrapping and powder coated furniture is available upon request. We can also supply custom foam fittings and inserts which are designed to perfectly fit around the contents of the case. This also enhances the amount of protection the case can provide to the items inside. If you are interested in a bespoke entertainment flight case or would like to learn more about our full range of products, please call us on 01635 579 518. You can also contact us by emailing us at sales@absolutecasing.co.uk.